Food, along with air and water, is an essential need for human beings. In the food passage, food undergoes a series of processes and gets split into micro particles. This process is known as digestion. Primarily food provides energy to body. It promotes the growth of the body cells protecting the organism. 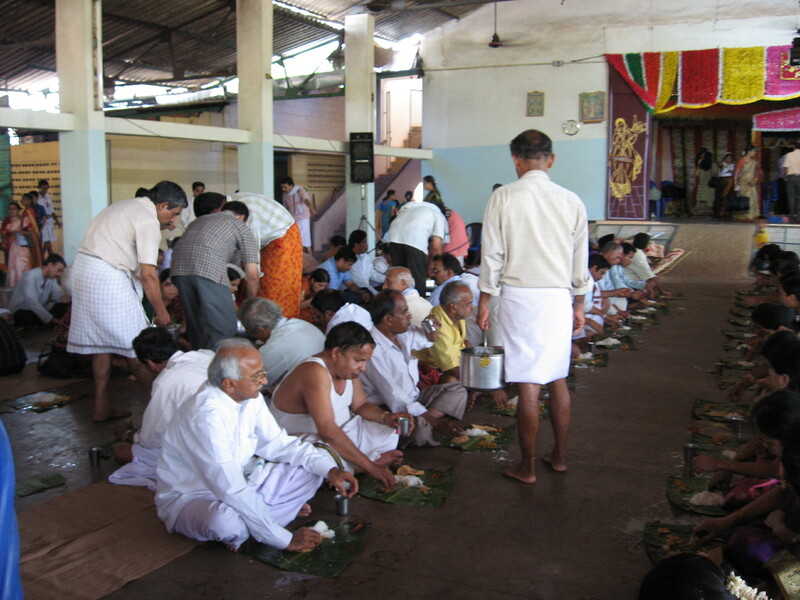 According to ancient Siddha Masters, a person should take 32 handfuls (kavalam) of food, that too two times a day. Hence the saying that"one time for a yogi, two times for a bogi (family man) and three times for Drohi. The food taken two times a day by a bogi should be digested properly and the waste material should be excreted two times a day. If the essence of food is absorbed and the waste materials are excreted twice on the same day, no toxicity will remain in the body. Consequently , no disease will afflict. We can prevent the affliction of illnesses and can live a pleasant life if we adhere to the regulation of food, quantity, the six tastes, etc. food (avoidance of drinking water or other beverages with meals is recommended to avoid diluting hydrochloric acid in stomach). - Do not chew food with your mouth open (when chew food with your mouth open then you tend to gulp air and this air will dysfunction the saliva's efficacy. Saliva is a liquid secreted by the salivary glands, contains salivary amylase to digest starch(glucose 2) in your food when you chew food. Digestion starts with chewing as salivary amylase begin breaking down food into its smallest basic units. After swallowing digestion continues in the stomach where hydrochloric acid continue to break down food. - Take 2 meals a day. In the afternoon and in the evening. - Take rock salt and fresh ginger before taking food. This will clear the throat and sharpen the appetite. - When you take food, a tumbler of water should be places on the right side. - One should not sit for taking food facing the north. - If one passes wind when he takes food he must leave of eating. He must not take any food during the day. - Sweet things should be taken first, salt and sour next; and pungent, bitter and curd with sour, astringent things like pickles / rasam at the end. 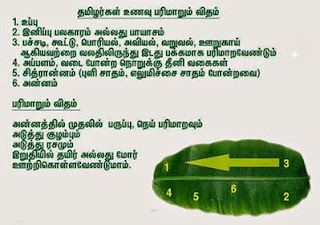 Principle of diet ~ It is a simple principle of diet in Siddha wisdom that vegetations that grow on a particular area, are capable of meeting dietary band medicinal needs of the local inhabitants. That is why so much emphasis was laid, and still being laid on 'regional diet'. If you change over to regional diet, there is no reason, why should you fall ill.
- Sweet things like payasam, dates, kesari should be eaten first and never at the end of dinner. - Take hard substances in the beginning, soft things in the middle and the liquids towards the end of the meal. - Do not run after taking a meal. - Walking after dinner promotes life. It gives good health. - After lunch, lie down on the left side for a short time. This helps for digestion. Surya Nadi works when you lie on the left side to ignite digestive fire. - Immediately after taking food, it is highly injuries to bask in the sun, swim, ride or run, sing, sit by the fire side, fight, and practice physical exercise of asana, pranayama or study. - Night meals should always be light and 3atleast hours before sleep (preferably before Sun set). - Do not take curd at night. Curd should be sour in tropical diet and never be taken without the addition of some salt. - Food, cohabitation, sleep, studying and walking in the street should not be indulged in at sunset. - Food, evacuation of the bowels, cohabitation, sleep, taking medicine should be done when the breath is passing through the right nostril. Diet as medicine ~ The purpose of taking food daily is to help the growth of the body, and to secure energy and immunity. If the above purposes are fulfilled, the soul functioning in the body will be in good condition. According to one of renowned Siddha master Thirumular if the physical body is destroyed, the soul will stop its function. In such condition 'meignanam' (the true wisdom) cannot be attained.